In some parts of the world overcrowded, informal public transportation leave women in vulnerable conditions. Photo by GrahamKing. In an article last week for the Guardian’s Bike Blog, Jane Madembo relived her experience as a public transit and bicycle commuter in Zimbabwe. 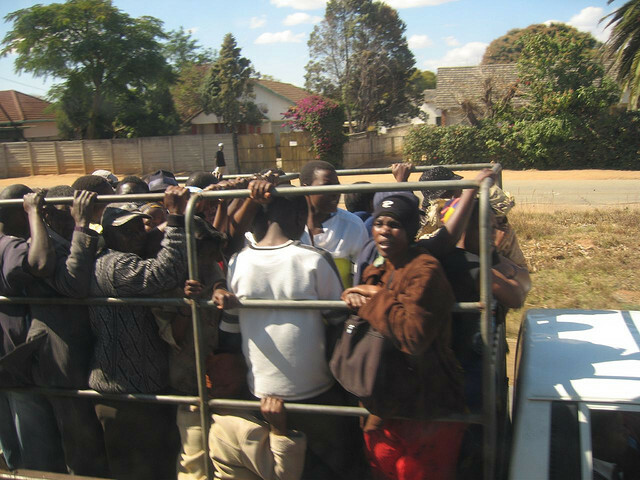 In the article, Madembo explains that public transport was scarce in the low-density, suburban areas where she had to travel for work, leaving her and other commuters to rely on inadequate and overcapacity transport methods. But worries for Madembo and other female commuters were not limited to a lack of transport option. The informal and overcrowded state of these transport options left female commuters in a vulnerable condition, fending off unwanted advances from men. Dealing with the harsh realities of the informal transport system in Zimbabwe, Madembo was left to acquire personal tactics to ensure her safety, like examining the faces of the drivers and passengers to make snap judgments. But everything changed for Madembo when she saw a Swedish woman cycling down a local road. Madembo’s new transportation mode drew a lot of attention from fellow commuters, leading some cars drivers to slow down, roll down their windows, ask why she is cycling and offer rides. But such attention did not faze Madembo. “I was no longer a hostage to religion, tradition or men. I was free. On my bicycle I felt like I was in a room of my own,” she explains. Read Jane Madembo’s full article here.